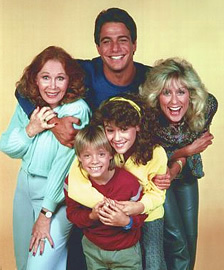 Performers include: Tony Danza, Judith Light, Alyssa Milano, Danny Pintauro, Katherine Helmond, and Rhoda Gemignani. Anthony “Tony” Micelli (Tony Danza) was once a second baseman for the St. Louis Cardinals before being forced to retire due to a shoulder injury. He’s left to raise his daughter Samantha “Sam” (Alyssa Milano) alone after the death of his wife. Determined to find a better environment for Sam, he decides to move them out of Brooklyn, even away from longtime friend Mrs. Rossini (Rhoda Gemignani). He ends up taking a job in upscale Fairfield, Connecticut, working for divorced advertising executive Angela Bower (Judith Light). Living in the Bower residence, Tony works as the housekeeper and helps to guide Angela’s nerdy son Jonathan (Danny Pintauro). He occasionally tries to keep Angela’s man-hungry mother, Mona Robinson (Katherine Helmond), under control as well. Round Two: What’s the Best Sitcom in TV History? One of the best comedy shows ever!